Does Jibantala ink Hindu obituary in Bengal to begin with? Will Chaitali Haldar, hapless Hindu girl, be rescued ever? No anti-Hindu tirade can ever be abrupt and even if the decrepit Hindus love to portray their persecution by Muslims along these lines the stark reality is that this notion is perhaps the most humongous fraudulence known thus far. The situation in Kulpi in the Indian state of Bengal and factors leading to the utter destruction of BDO (Block Development Office) and Kulpi police station are also same – a subconscious anti-Hindu prejudice among a vast section of people adhering to Islamic ideology. This prejudice stimulates Islamic thugs to harm Hindus now and then. There is no need of any sectarian outlook or even profound knowledge to perceive and comprehend the mounting (wildest) attacks on Hindu belief (confined no longer in India only) across the globe and without a shred of doubt this intensive psychological warfareis not tormenting Hindus only but is compelling them also to realize that the fast Hindu Dharma is left the better it is.Well, application of the word warfare (in this context) is perhaps quite gentle. Warfare is an active struggle between competing entities whereas this is one of the best specimens of pogrom continuing hitherto (throughout the globe); Hindus have not been able to build up any resistance against this deadliest attack, not to speak of waging any such.If Hindus have got to exist, it is high time to wage a (virile) ideological counter attack. Not a step back, such is the call of Dharma.How can it be done? Why Hindus are treated as Non-Entity in India? Islamic radicalism in Bengal is getting bigger once again; a representative body of private religious madrasas in the state has rejected (of late) Chief Minister Mamata Banerjee’s offer of affiliation to 10,000 madrasas. West Bengal Rabeta Madaris-e-Islamia Arabia alleges presence of a conspiracy to bring religious madrasas in political fold. Aforesaid thoughts do stem from an immense confidence that Islamic radicalism is enjoying at the moment; surely, if it remains unchecked, basics of social pluralism will soon have a painful (or even -less) death marking the end of civilization in the region. What has taken place in Kishenganj, Bihar, under the aegis of Islamic students drumming up strong protests against delay in establishment of Aligarh Muslim University (AMU) StudyCenter through immobilizing extensive rail communication system in Eastern India for hours is no unusual. Perhaps we have reached the age when it is no longer possible for us to remain confined within a room and have our legitimate rights from adversaries. Surely, prior to doing so there is the need of a proper, constitutional mindset – absence of which appears to be the greatest impediment these days. But another suitable term must also be assigned to the entire movement – audacity. Without tacit support of the governance the movement could not have been so audacious. The rage expressed in the movement also reminded quondam warriors of the heyday ofPakistan movement. Is this a new beginning? 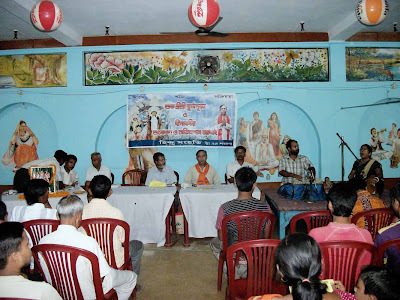 On October 15, 2011 a Vijaya Sammelan (assembly) took place at Deganga, center of worldwide attention owing to devastating anti-Hindu riots in 2010, amidst splendor and delight. The presence of more than 200 people (including women) in the meeting stimulated the environs to a large extent.Persons sharing the dais included Sri Tapan Ghosh, president, Hindu Samhati, Prasanta Pal, Makhanlal Das (ex President of VHP, N.24 Parganas), Ashok Roy (Kolkata), TG, Advocate Brojen Roy. A gorgeous Vijaya Sammelan ruled by high-flown ideals took place at Minakha block on October 16, 2011 and attracted more people than expected. The program came to pass in Mahitosh Sangha Club ground, Malancha, North 24 Parganas dist.Persons mesmerizing the audience through their robust speeches included Tapan Ghosh, president, Hindu Samhati, Arun Bhattacharya, ex Working President, VHP, Dakshin Banga, Sri Narayan Ghosh, President, Basirhat, HS. Can Hindus in Bangladesh vent their anger against Vested Property Act amendment delays through affecting power balance in subsequent general election? Hindus struggling tooth and nail On October 06, 2011 a fierce Muslim mob persecuted Hindus heavily at North Radhanagar railway station, P.S. Mograhat, Dist. 24 Paraganas (South) and the source of trouble was a fracas between a minor Hindu vendor of drinking water and a Muslim youth, who declined to pay after drinking water and thrashed the little vendor also mercilessly. Owing to Hindu protests the Muslim youth fled but returned with a fierce Muslim mob, having lethal weapons, soon – this was followed by a thorough persecution of Hindus, plundering of Hindu shops and also railway ticket counter.Police is pressuring Hindus to compromise but they are declining it with force. Fate of Bengali Hindus is dwindling – scores of reports, articles and meticulous investigations have evidenced this from time to time and unless something is done before long, the entire community will be doomed forever. Hence, there is the need of pro-active people to change the destiny. They can take lessons from Bimalangshu Roy Foundation in the Indian state of Assam – engaged in saving the community from ultimate ruin.It has asked for immediate interference of Prime Minister Manmohan Singh and Chief Minister Tarun Gogoi to execute Immigrant (Expulsion from Assam) Act, 1950, in the state as per Supreme Court directives and also to render the benefit of proviso to Section 2 of the said Act to the minorities of Bangladesh, persecuted, displaced and also compelled to migrate to different parts of Assam. On October 03, 2011 – the day of Maha Saptami of Durga Puja, GRP office was plundered by local Muslim youths and all these happened since a GRP (Government Railway Police) police officer dared to check a Muslim youth on grounds of suspicion. The police person went unharmed but his office was plundered by Muslim youths to express their anger. Islamic pogrom against Bengali Hindus in Noakhali and Tipperah, positioned in the then Chittagong division of pre-partitioned Bengal, started on October 10, 1946 – on the day of Kojaagari Laxmi Puja. Nearly 70 years have passed by now but the religious persecution of Bengali Hindus in Noakhali, enough to put even Gestapo and perpetrators of Soviet Gulag to shame, haunts Hindu psyche on each Puja day.Day of Kojaagari Laxmi Puja has become synonymous to Noakhali genocide.Can it be separated ever? Ask yourself. Hindu Samhati Vijaya Sammelan at Kalyanpur Baidyanath Mandir, close to Baruipur in South 24 Pargana dist, took place on 9 October at 3 pm.Persons who graced the rostrum on the occasion included Tapan Ghosh, president of Hindu Samhati, Dinabandhu Ghorami, Advocate Somraj Ganguli, Samar Bhattacharya and Jiban Kumar Saha, Kolkata Madhya Bhag Sanghchalak of RSS. The name of village Santoshpur, P.S. Jangipara, Dist. Hooghly is not known to many people even if it, inhabited by Bagdi (Barga Kshatriyas) communities, has been fighting a desperate battle against Islamic thugs in the environs for years. The position of the village is also strategically important – it is close to Furfura Shariff (distance is of 4 kms. between the two). Without a doubt, had there been no Hindu Samhati, the Hindu resistance movement would not have escalated such. 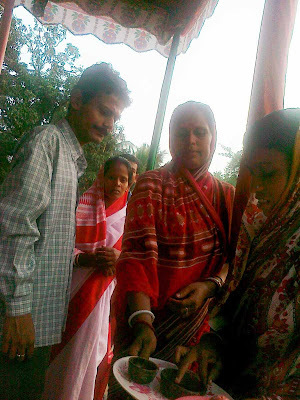 To worship the struggle, villagers arranged Durgapuja in this year for the first time.On October 08, 2011 Vijaya Sammelan, headed by Hindu Samhati, took place in the village making the villagers highly joyous.